I have Paula Deen to thank for this recipe. Wait, where are you going? Don’t leave! There isn’t even a whole stick of butter in it! OK. Just hear me out. Back in the day (2007) before I knew food blogging was even a thing, I liked to bake and I would sometimes take photos of my baking adventures. Shocking, I know. One particular adventure was with Paula Deen’s Lemon Blossoms. The photos were… not good. But we all have to start somewhere, right? More important than the photos, the lemon blossoms were awesome. I managed to get some friends hooked on them too. After some trial and error, I learned that the mini muffin sized ones were best. They taste like bright lemony donut holes and being so small, they’re infinitely pop-able. I’m happy to report these Meyer Lemon Blossoms are just as bright and addictive as the Paula Deen version. I find myself walking past the container I’ve stashed them in, thinking “Oh, I’ll just have one…” and before I know it, I’ve “just had” half a dozen. 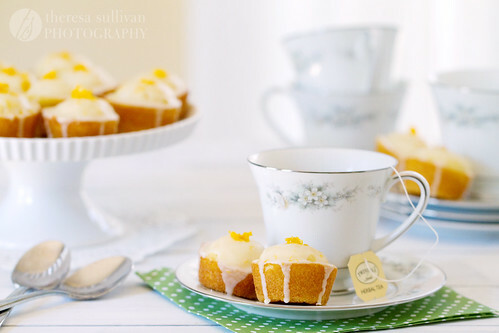 I think they’d make perfect little tea cakes for a shower or luncheon, or you can eat them my way – two at a time over standing over the kitchen counter. While I haven’t tested it, these blossoms should be just as delicious made with regular lemons if you can’t find Meyer lemons. They bake quickly, so keep a close eye on them to avoid over baking – start checking them around 8 minutes. Do NOT skimp on the glaze. It adds a big punch of flavor and helps keep the blossoms moist, so really lay it on thick. Preheat oven to 350°F. Grease a non-stick, 24-cup mini muffin tin with baking spray. In a small bowl, whisk together flour, baking powder, baking soda and salt. Place Meyer lemon zest and sugar in bowl of a stand mixer. Add 1/2 tablespoon of lemon juice into a 1 or 2-cup measuring cup, then add milk to reach 1/2 cup. Stir and set aside. Using the paddle attachment on medium speed, mix sugar and zest together until fragrant and damp, 1-2 minutes. Add butter and beat until light and fluffy, 3-4 minutes. Add vanilla and lemon extracts and egg, beat to combine. Add milk mixture and beat to combine. Lastly, add flour mixture 1/3 at a time, beating just until combined and scraping down sides if needed. Spoon approximately 1 tablespoon (or less) of batter into each cup of the prepared pan and bake at 350°F for 10-12 minutes (checking after 8), or until top springs back to the touch. Cool in pan for 2 minutes, then flip onto wire wrack to cool completely. To glaze, lay wax paper under a wire rack. Add powdered sugar, zest, oil and vanilla extract to a small bowl. 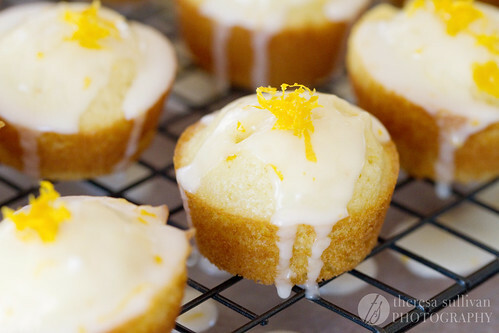 Whisk in 3 tablespoons Meyer lemon juice, then test consistency (you want it thick but fluid enough to spread) by dipping the top of one muffin in the glaze and setting it upright on the prepared rack. If the glaze runs slowly down the sides of the muffin, it’s perfect. If it’s still too thick, whisk in 1/2 tablespoon more of lemon juice and retest, up to 4 tablespoons. Spoon glaze over cooled muffins or dunk muffins in glaze, and set on wire rack to harden. I’ve been waiting for the recipe ever since I saw your photo of these on your Facebook page. They are so pretty and your pictures of them are gorgeous. 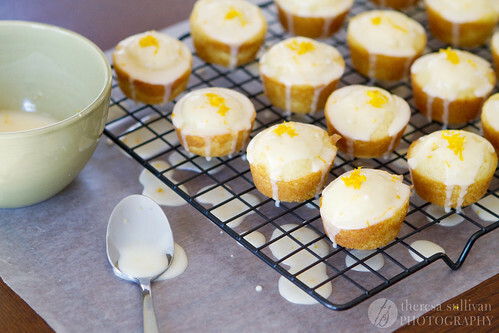 Lemon is my favorite dessert flavor, and I adore Meyer lemons. This is getting bookmarked! Yum, I love lemon cakes! Making mini cakes is a great idea. I really need to try some of these meyer lemons that everyone keeps talking about. My grocery store never has them and I know I should go to Whole Foods but I hate driving all the way down there. It’s too bad they’re only available for a short time. Oh well, one day! That picture with the teacups is gorgeous!!! Looks absolutely delish! I love anything citrusy. Your recipe is so far superior to Paula Deen’s. I made yours after I had already bought the ingredients for the original Deen recipe, so I decided to make them too just to see if there’s any difference. There really is no comparison in texture, taste and punch! The Meyers lemons take it to another level of citrus that’s addictive. Thanks for a tremendous makeover!